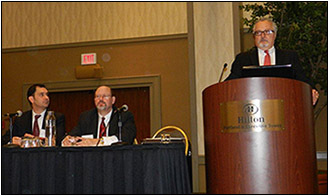 On November 8, 2012, health care attorneys from Schwabe, Williamson, & Wyatt kicked off the Oregon Ambulatory Surgery Center Association's Annual Conference with presentations addressing recent regulatory and legal updates. The presenters included: Kelly T. Hagan, a Shareholder with Schwabe and attorney listed in U.S. News-Best Lawyers in America for his work in health care law, Bruce F. Howell, a Shareholder at Schwabe and attorney also listed the U.S. News-Best Lawyers in America in health care law, and Peter D. Ricoy, Special Counsel with Schwabe and past Chair of the Health Law Section of the Oregon State Bar. Schwabe serves as outside legal counsel to the Oregon Ambulatory Surgery Center Association. Over 100 people attended the two-day event, including representatives of many prominent Ambulatory Surgery Centers in Oregon, physicians, legislative and policy analysts, and executive staff and board members of the Oregon Ambulatory Surgery Center Association. The conference featured U.S. Senator Ron Wyden as the keynote speaker. Mr. Howell addressed the impact in Oregon of the recent decision by the United States Supreme Court on the constitutionality of the Affordable Care Act, the health reform bill passed in 2010. Mr. Hagan described Oregon's unique reforms to the health care delivery system through the creation of Coordinated Care Organizations. Finally, Mr. Ricoy described the creation of the Oregon health insurance exchange and the implications for Oregon ambulatory surgery centers.